Many factors go into dogs’ behavior, including behavior that seems aggressive. It’s helpful to understand some of the “triggers” which can set off fear in dogs. And it’s important to know that dogs show signs indicating they are about to lunge or bite. It’s often possible to recognize these signs and manage the behavior. Dr. Jill Sackman, BluePearl’s head of behavioral medicine, talks about the types, signs and treatment of aggression in dogs. Fear-based – Fear is the number one cause of dog aggression and dog bites. Like humans, dogs have individual fears that may or may not make sense to others. Things that commonly trigger fear in dogs include other dogs, babies, children, people and veterinary visits. Dogs who are fearful toward other dogs or people will lunge, snarl, snap and possibly bite to get scary things away from them. Territorial – If your dog’s aggression relates to a boundary such as the backyard fence, front door or car windows, he may have territorial aggression. Dogs were partly bred for defending the home, so the need to protect their space is engrained in their biology. However, the territorial instinct can lead to aggression. In some cases, your dog’s boundary may be his personal space when he is on a leash walk or visiting a veterinary clinic. Resource guarding – With resource-guarding, your dog is defending a high value possession. Resource-guarding triggers are items your dog is willing to battle over, such as a couch, a person, food, food bowls, a bed or a favorite treat/chew toy. Never reach and take away a high value item from a dog that is guarding it, or you may get bitten. Maternal – Many mother animals have the natural instinct to defend their young at any costs, and dogs are no exception. Play-based – Dogs with play-based aggression get overly aroused during playtime and grab with their mouths, or exhibit other aggressive behaviors. The dog may feel that this is just playing, but real injuries can result. Inter-dog – Inter-dog aggression refers to dogs who fight each other within the home. A dog’s past experiences may make him more prone to aggressive behavior. For example, a dog who was previously grabbed and bitten by another dog may develop fear-based aggression to dogs he does not know. Aside from dogs with past traumatic experiences, there really is no “type” of dog that is more prone to aggression than another. It’s a common misconception that a dog’s breed determines its likelihood for developing aggressive behaviors. It’s important to recognize the signs of aggression in dogs. Aggressive behavior usually builds up from a low point to a high point when the dog is exposed to the something that leads to the aggressive behavior. It is likely that a dog displaying aggression is stressed or fearful of certain stimuli or a situation and resorts to aggression as a consequence. An aggressive dog is likely communicating his unease in a particular situation. 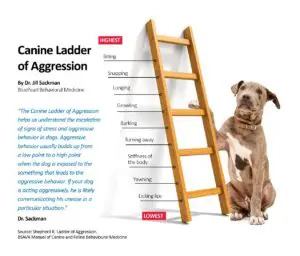 A helpful way to understand this is to look at the canine ladder of aggression. On the lower rungs, there are more subtle signs of stress such as licking lips, yawning from stress, stiffness of the body and turning away. If the dog cannot remove himself or the situation becomes more intense, he may exhibit medium-level signs of stress such as growling, barking, snapping or lunging to protect himself out of fear. And finally, if your dog feels truly believes, “I think I’m going to die,” he will escalate to the highest rungs of the ladder and snap or bite. In most cases, your dog bites because he feels the need to preserve his life and the lunge, snap and bite are a way to get the cause of fear away from him. It’s important to keep in mind that there is no such thing as a cure for aggression. Aggressive behaviors are managed and reduced through proper treatment with a veterinary behavioral professional. It’s also essential to understand that aggression is a behavioral problem, not an issue of obedience. Desensitization to the trigger is a key part of managing aggression. This process involves rewarding your dog for behaving calmly around the fear-provoking aggression trigger. When your dog faces the trigger without any signs of aggression, even if from a distance, give him a particularly tasty treat like a chunk of hot dog. You are communicating that good things happen when he looks at that scary dog, person, etc. For more articles on pet behavior, check out Dr. Sackman’s bio.